There's a lawsuit under way with the Authors Guild and the American Association of Publishers suing Google Inc for massive copyright infringement. Oh, the echoes of the RIAA v MP3.com lawsuit (full disclosure: I worked at MP3.com during that time period, and was part of the team that worked on the my.mp3.com service which was the basis for the RIAA's suit). Lawrence Lessig is arguing that Google Book Search qualifies as "fair use" as defined by 17 USC 107. The authors and publishers say, no way. They say that Google is blatantly ripping off millions of books without first getting permission from (read: paying) the rights holders. Given the way the RIAA v MP3.com case went, I side with the authors and the publishers, and I think Lessig is wrong. In his nifty little video, Lessig makes two main points. I question the validity of both of them. Let's start with the first one. Lessig argues we should look at the judgement of this case when considering how the Google case should be decided. 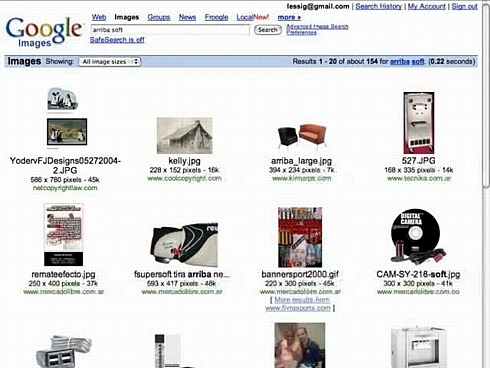 In Kelly v Arriba, Arriba was sued for copyright infringement for an image search service similar to Google Images. For details on the case, you could start here. and has this to say around 16 minutes into his video: "You can see that in this picture there are thumbnail versions of images that exist on other websites, and if you clicked one of these thumbnail images, you would be taken to that other website, and given the opportunity to see that full image on that other website. There was no effort to copy the original image and store that either under the Arriba Soft case or in the Google case, instead this is simply a way to grant an index into images that are available elsewhere. Now, the court said, what happened in this case is that the original copyrighted work had been reduced, so as to link to an image, a thumbnail image, linked to the original image. So there was a transformation of the original copyrighted work by transforming it into a thumbnail. That thumbnail itself wasn't a substitution for the original copyrighted work, the quality of a thumbnail is so poor, no-one would use that instead of the original copyrighted work. And all that the transformative work did was give you access to the original copyrighted work, in a way that protected and advanced the interest of the underlying copyright owner. And that's what grounded the claim for fair use, which the Arribasoft case ultimately held, protected the practice in that particular case. "And so too, could you argue, is what Google doing protected by fair use," says Lessig. "Because what Google is doing here, is also producing a transformation of the original copyrighted work. That transformation produces a reduced 'image' in some sense, of the original copyrighted work, so again, here are the snippets:"
He goes on to say this: ". . . here are the snippets that Google displays as a way to give you access to the original copyrighted work, once you see this reduced quality image, then you have the opportunity to link back to the original copyrighted work in a way that drives you to that original work. The difference of course is that the work here is not on the computer, because we're indexing books in physical space, whereas the works in the arribasoft case were on a computer somewhere, you could see the original work on the computer, but the principle that unites the two cases is that the transformation produces a reduced version of the original copyrighted work, itself not a substitute for the original work, but instead providing an advanced index or access to the original copyrighted work in a way that actually adds value back to the original copyrighted work. That principle in both cases drives the conclusion that there should be "fair use" in both cases. So this link to books is just like the link to images in the Arriba Soft case." And he shows an equation to nail home his point. So. Why do I disagree with this argument. In Google's case, they are clearly scanning in the original copyrighted pages of these books, no doubt using fairly high resolution digital photography, and then it seems they are using some sort of optical character recognition to transform the printed text on the page into a digital text on the computer. On Google's computer. I have no idea if Google is OCRing and then running an indexer on the resulting body of text and then tossing the body of text and keeping the index. I bet they're not. I bet they're keeping the whole enchilada. I mean, look at what Google's doing. 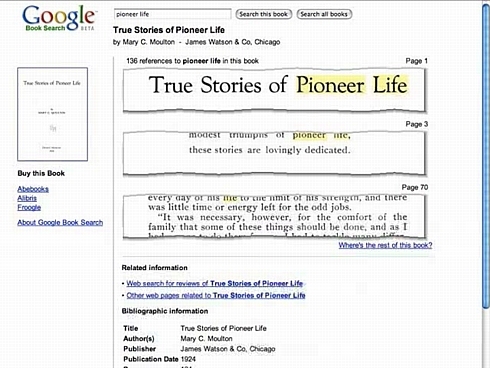 Or must be doing: how would Google know where the words "Pioneer Life" appear in a bitmap image of the scanned book, unless they had scanned the book's entirety, kept all the bitmap images, and recorded where the printed words in the image match up to the text words in the digitized OCR'd body of text? That's got to be some pretty fancy technology to do that. Remember, Lessig said this above, "That thumbnail itself wasn't a substitution for the original copyrighted work, the quality of a thumbnail is so poor, no-one would use that instead of the original copyrighted work." Ok, so one attribute of a thumbnail is poor quality, right? What happens if the quality is nearly as good as, if not BETTER, than the original? If you use advanced digital copying machines to photograph every single page of a book, including, ironically, its copyright page, and FAITHFULLY retain the original font, layout, and pagination of the book, you have to agree, it sure as hell is not a "thumbnail", or "reduced" copy of the book. Far from it. If there's any TRANSFORMATION going on with Google and books, it's extracting the information from the book and storing it in its entirety in not just one, but multiple formats! All without permission of the author, the publisher, or other rights holder. But wait, one more thing before moving on to Lessig's argument number two. Lessig talks about the wonders of Google's "snippets" -- see, they're only "portions", they're clips! Fair use! Fair use! Well, I don't think so. The "snippets" are clearly artificial. Lessig likes to use a 1924 copyrighted book called True Stories of Pioneer Life to make his case. He shows the little snippets in the image above. But look closely at that screen shot. It says "136 references to "pioneer life" in the book. How would Google know that? It would know that because it has the whole book digitized, both photographically and textually! Do some other searches in this book. For instance search for references to the word "corn". It finds 14 in the book, and shows you three snippets. Search for "evening". It finds 16 references, and shows 3 snippets as teasers. Search for "indian". 9 references, 3 snippets. And so on. Google knows this book. It knows it intimately. And it is able to show you snippets that are photographic portions of the actual printed pages of the original copyrighted work, with the word reference highlighted right in the images itself. Again, amazing technology, but forget the geekitude for a second. This is not reductive transformation. It's expansive transformation. Google is taking someone else's work product and without their permission, copying it in multiple formats and letting people search on it. I don't deny it's handy. I just deny Google should be able to do it for free. And one more thing. Those "Buy this Book" links on Google Book Search results pages. Who gets paid when Google sends the user to Abebooks or Alibris? Or Froogle? Lessig's second argument relies on his interpretation of 17 USC 107, the section of copyright law pertaining to the concept of "fair use". Lessig reduces the text to a simple 1,2,3,4 image, summarizing the law as having to do with work, use, amount, and markets. Lessig focuses on his number four, "markets". Convenient, since I think a strong case can be made that what Google is doing is flat-out commercial in nature (1); that the nature of the copyrighted work is that it's a printed book and was intended to be just that, bought by a reader or library (2); and that it is outrageously clear that when it comes to the "amount and substantiality of the portion" of the books being copied, Google is exceeding the spirit of what the "fair use" principle expresses because, I mean come on, admit it man!, Google is copying the whole document, and saving not only the visual PHOTOGRAPHIC copy of it, but a digital TEXT copy too! This is way, WAY beyond "transformation" or "reduction". But Lessig focuses on his number four, "markets". He argues that the author and book publishing "market" has failed to invent something and so therefore don't deserve to enjoy whatever benefits Google derives from its hard work. Er, I mean, whatever Google derives from its copying of all those millions of authors' years of hard work. Or something. Lessig says this (at around 29 minutes 24 seconds into the video): "So here's the choice the law presents us with. If we recognize the right of the authors or the publishers to demand that Google get permission before Google has the right to index and make accessible that index to our past, then the authors and the publishers may get a few pennies for each work that's within their collection, but at least 50 percent of our past will be lost. 50% can't be within this index because there's no author or publisher to ask. 50% will be invisible to the world that looks to our past through the lens of digital technologies. That's the choice they've forced us to make, and that's the choice that the law of fair use must reckon when it decides whether this use by Google is ultimately 'fair use' under the law of copyright." "Copyright @ andipantz.com". Hmm, I thought. I wonder where he got this. 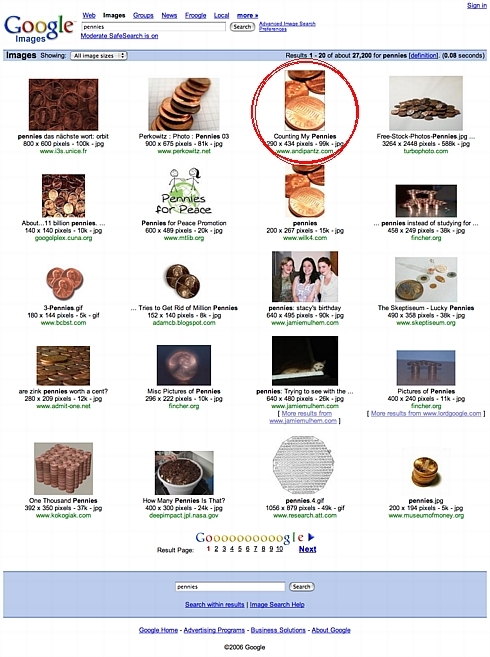 Given Larry's Google fandom, I figured it might be worth going to Google and doing a search for "pennies". And then click on "images". 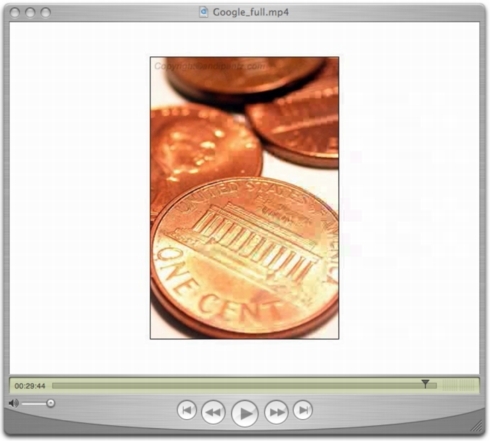 To look at all those fair-use thumbnails of pennies, of course. Andrea K. Gingerich's blog is what we get. And her copyrighted photo that she's entitled "Counting My Pennies". It's dated August 30, 2004. To be clear, the "Copyright (c) andipantz.com" is watermarked on Gingerich's blog -- this is not a watermark that Lessig added. In fact, as far as I could tell, ALL of Gingerich's images on her blog have that watermark added somewhere in the image. I wonder if Andrea Gingerich gave Professor Lessig permission to use that photograph in his widely-distributed Bittorrented movie? Apparently she did not. At least, Andrea Gingerich tells me she did not. She's in Costa Rica at the moment, but still checking email. :-) See, I emailed her and asked. In fact, she thanked me for bringing it to her attention, and said she was going to fire off "a nice email" to Lessig directly. Let's get back to the points Lessig makes about market failure legitimizing Google's activity. Well, wait. One thing. Remember, he said this: "If we recognize the right of the authors or the publishers to demand that Google get permission before Google has the right to index and make accessible that index to our past, then the authors and the publishers may get a few pennies for each work that's within their collection, but at least 50 percent of our past will be lost." Our past. Our past. WHOSE past, Google-boy? If someone writes a book, copyrights it, publishes it, sells it to the marketplace, how does that make it part of your or my past? Seems to me, copyright is copyright. You got a beef with that, track down the copyright holder. Oh, it's impossible? Oh, it's a pain. Too bad. It just takes a lot of time. But someone somewhere is the copyright holder of that out-of-print book you so wish to copy. Maybe Google Search will help you find the rights holder. Stranger things have happened. Remember, item (4) of 17 USC 107 says, "the effect of the use upon the potential market for or value of the copyrighted work." Lessig argues that Google's Book Search project will only have positive benefits for the potential market for or value of the original copyrighted work. That may be, but I think the reality is, GOOGLE ITSELF is going to be the party that enjoys positive benefits of dusting off and exposing the original copyrighted work to a wider audience. Google, I would argue, is the clear winner. Who loses? Always a useful question to ask. The author loses. They don't collect Lessig's "pennies". Maybe that's all they get, but dammit, they should get 'em! The publisher loses. Maybe it's long out of business, maybe it isn't. It still loses. Someone's graves are spinning while Google's reaping all the rewards. You know who else loses? We all do. And not in the way Lessig thinks we do. We all lose because what Google is doing is hastening the demise of libraries. Hastening the demise of books. Hastening the requirement that you must have a computer, and a network connection, to get access to books. Face it: books are toast. Google Book Search is the toaster. So let's see. If Google wins this case, can we expect to see Google Movie Search, and Google Music Search next? After all, how else am I going to be able to find long-out-of-print copies of that obscure 1930 movie that nobody's seen in 75 years? Or that obscure 78 record made in 1941 that nobody's heard since, well, 1941? If Google wants to rescue the cultural output of the world and make it searchable and retrievable, I am all for it. I just want Google to do it right. Pay for it. Spend your billions to track down every rights holder, and negotiate a deal. With every damn rights holder. One by one. It may take 200 years. So be it. 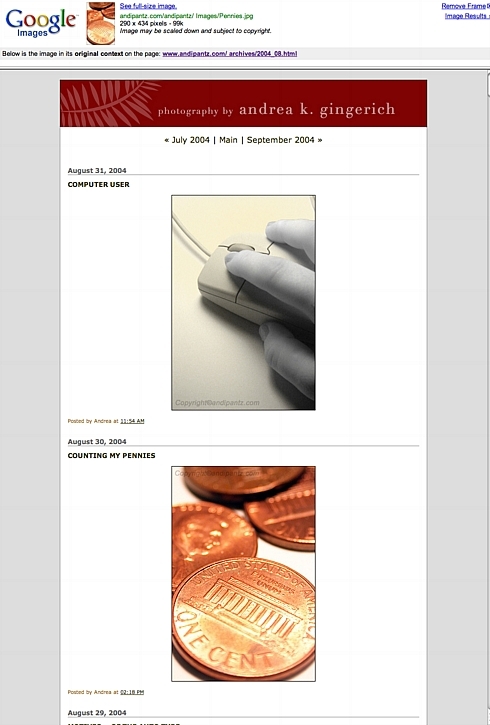 I heard from Andrea Gingerich today and she informs me that she emailed Larry Lessig about his use of her "Pennies" photograph. She says he wrote back and apologized for using it and said he'd remove it from the video. While you may be substantively correct, in that Google may be in violation of copyright, the bulk of your argument seems misdirected. There are (roughly speaking) two points in time at which Google could have committed such a violation: when they scan and process a work, and when they serve "snippets" from their server farm. Lessig's argument is plainly directed at the latter time, while you seem to be either talking about the former or squishing them together. First, if Google has scanned and processed a work without purchasing it they are plainly in violation of the author's copyright. On the other hand, if they purchased and retained the work, it may or may not have been fair use to scan and process it. So far as I know, Google doesn't make the entirety of any work available to other people. That's what Lessig is on about -- however complete and high-resolution the copy Google's computers may contain, only reduced "snippets" are ever served. He should apologize and pay for use of the pennies, though. Who says that Google has to make the entirety of any work available to other people? Just the act of copying is the question. Just like it was in the MP3.com case. Google copying millions of books without permission -- I don't care if they never let ANYONE (other than Google employees) see those copies. The issue is the COPYING in the first place. It's actually not clear to me from the statute that your assertion is correct, and I wouldn't be surprised if the question of copyright violation from private use has never been litigated. If MP3.com had made tons of copies, but never displayed them, then there would have been no lawsuit. And it has been established (though I can't cite the case) that proxy servers such as AOL's, which do copy and redistribute works, do not infringe copyright. Not to mention that Google's indexing of the web itself has not been held to be an infringement of copyright. I think the only real legal danger for Google is if someone can demonstrate that you can use their APIs to reconstruct a book (or significant portion thereof) from their snippets. I've written similar at the link on my name. I don't see any outlet for them to claim fair use on running entire printed books through high-res scanners. Everyone argues that Google gets money and the publishers/authors get nothing. Well, Google does link to places to get the book and a person would then buy the book. Lets say that this isn't the case. People are using this to just find quotes in books and Google is making money on Ad's. How do publishers expect to get paid? Should Google pay for the rights of each book? Should they get paid everytime someone reads a snippet? Should I have to pay everytime I visit a book store and read a few pages of a book and put it back down? The book store isn't profitting, but neither is Google in this particular case. I see Google Print as a card catalog that is actually useful. You can research topics, then go and buy the book or get it at a library. I don't see how a library can get one copy of a book and let everyone read it for free, where Google is helping to easily sell books and it's getting complaints. To start, I don't think that this will hurt libraries- with Google's fetish for indexing everything I don't doubt that libraries will be a stop along this route. And when Google ties Print with Library, you can find a hard copy of the book, organized by location, for the taking. That's pretty wonderful, if you think about it. Librarians are sure to love it, because it will streamline the ILL process. Now, one thing we can say for certain- Google Print is a situation wherin everyone can benefit. Google gets ad revenue, perhaps even referrals for sales. Publishers get more sales, especially in the long tail, and users can get the content they desire. That, however, doesn't make it legal. For example, some guy put SF MTA schedules online- illegal. The schedules are free for the taking, and he just digitized them to be convienent, and everyone benefitted- but it still violated copyright. So, the question comes down to- does GooglePrint violate copyright? In the final user experience- I would have to say no. "Snippets" are certainly fair use. We have to examine the process. You're right, the most likely process is Scan-to-Bitmap, OCR, Index. If I own a book, do I have a right to Scan-to-Bitmap? Well, I'm allowed to make backup copies of other media, so I don't see why not. Can I OCR that book? Well, once I've ripped a CD, I can convert it to multiple formats- that's legal. Can I then index it? Well, that's what your hard drive does, arguably. And if you're on a Mac, you've got Spotlight, in Windows, there's WDS and GoogleDesktop- are we going to say that's illegal too? The next step then, is the fact that Google is tying these two things together, and I think that's where they're in real legal danger. Everything I've discussed so far is for my own personal use. Is it legal for me to say, post a list of my album collection along with snippets, index it and make it searchable, and post that online? I would argue yes, and if it's legal for me, then it's legal for Google. PS: You really need to adjust your spam filter. The words "route" and "desire" were substitues for other common usage words that were pegged by it. I had to submit my comment multiple times- very frustrating. 1. Concerning his use of the pennies. 17 USC 107 exception to copyright "scholarship... teaching." Mr. Lessig's piece is clearly both. Furthermore, his attributes the work. When you chose to personally attack Mr. Lessig you lost my respect. 2. The past to which Mr. Lessig is refering is our collective past. Your ignorance to the importance of literature to the greaty story of humanity is revolting. Kevin re your (1): you claim "he attributes the work". Where? I must have missed it. I watched the video several times. I didn't see it anywhere. Oh, do you mean the "Copyright (c) andipantz.com"? That was done at the andipantz.com website. Not by Larry. (2) If you had ever read anything by me over the years, you'd know I've repeatedly brought up the issue of how the digital age has a terrible flaw: it's all going down the bit-bucket and libraries aren't doing enough to save it. For instance, publications like SLATE and SALON, to mention but two. They're not indexed in any library, as far as I can tell. Not in the Readers Guide to Periodical Literature. Oh sure, they're prolly in Lexis/Nexis. But what happens when SALON finally goes out of business? Or the Post finally tires of owning SLATE? At some point these publications go away. Where are the archives? How will historians 50 years from now access stories from online publications such as these? Particularly exclusive news stories and scoops that were, when they were published, major news items. I think it's terrible that any culture might lose its historical output. I hope that doesn't happen. I just don't want a single for-profit corporation, Google or anyone else, to be the savior of all this content. No matter how non-evil Google may forever strive to be, I don't trust it. It would be unwise to. What I wish Google would do is launch a nonprofit foundation, with oh, say, $1 billion in funding, and put Google Book Search under that organization's ownership and caretaking. Not under the for-profit business. If Google's doing this for the benefit of the world and not for its own gain, then Google Book Search should not be a "product" of a for-profit corporation. It ought to be owned and operated by something more transparent. Google Inc is not transparent. They're the very opposite. I think there are some other follow-ups that may be relevant but could not find full versions yet. 2. In any event, it's also instructive to look at the criteria for damages. 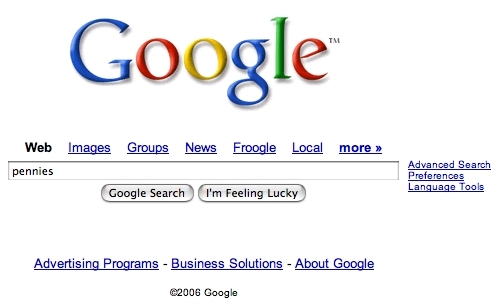 It seems that the size of the company mattered, so Google would not fare well there as a (possible) willful infringer. 3. There is not much transparency in terms of how Google is using this material. Obviously you have the end-user aspect which has been described clearly here. But it's been stated by one observer, George Dyson in Edge, that one of the reasons for the scanning is for AI purposes. It seems quite reasonable that this rather large corpus could be useful for a variety of AI-related algo/datamining/technology purposes not visible on the front-end but which are monetarily beneficial to the company. I think it's important to have more transparency if Google is going to be allowed to claim fair use on such a grand scale. 4. One related legal tangent perhaps somebody has some insight on: If a person's html book as listed on their website is copied in whole by Google and cached on it's servers, with all the same styling, images, code etc. , then isn't this the same thing as copying the hard copy book? ie, Is Google's standard web crawling, copying, indexing etc. the same legal isue as what we are discussing for books (for legal purposes)? Or if not, then how is it different? After all, they do make copies of websites without the owner's explicit permission, don't they? Ever seen the number of copy (scanning really) machines are in libraries? Kevin - you're wrong about the exemptions for academics. These apply only to copyright work that is the subject you're studying, NOT just any image. Were Lessig writing a critical study of that image, or comparing that image with another as a teaching aid in a photography class, he would be covered. As it is, he's simply using it as an extra image ("page furniture") and he's not. Furthermore, and this is a common mistake, simply attributing the work does not exempt you from seeking the permission of the rights-holder. First off, I disagree with Kevin. Your article is very well-written, and I totally respect your thoughts and input. I'm glad you responded to his post. Let me begin with a question. Do you think Google should get permission to index each webpage for its Google Search? They don't get permission because most people would like their pages to be indexed. It benefits them to have their pages indexed. Google does provide the capability to opt-out, for the few who don't desire to be indexed for some reason or another. The truth is, most people desire to be indexed. In the same fashion, Google is providing an opt-out for those who don't desire for their books to be indexed. It benefits the author to have his/her books indexed. I will use Google Book Search to help me find a book to buy, and I openly invite Google Movie Search and Google Music search to help connect me to what I'd like to buy. Technology like this just makes it easier, and I'm willing to pay for that technology. I don't think your argument is nearly as iron-clad as you believe it is. I think a persuasive case could be made that Google's copying is for research purposes, since no advertising appears on the pages with excerpts. In addition, the relevant question is how much of the book is presented to searchers, not how much of it Google scans, and a few sentences clearly would be covered by fair use. Speaking of fair, I think slamming Larry for a slide he used in his presentation is a bit unfair, or at least petty. Yes, it is copyrighted -- but he didn't use it in a published, commercial work. Bringing that up only demeans your argument. - Isn't Google reducing the quality by only letting you look at some pages rather than browsing the whole book? You say they have the full book, but Ariba may have had a high-res image; if you only allow people to see a low-res version, it doesn't matter what's on the server. - Isn't that like snippets, like the ones returned in a (normal SERP) search result? - Does evdb spider event sources? (I think so, but don't know so.) If so, is that fair use? Even though the descriptions of events are copyrighted? Your entry is both offensive and unconvincing, in part due to your lack of respect for Mr. Lessig and your immature tagging of those who disagree with you as "google fanboys." - I do not work for Google. - I [censored] a huge fan of My.mp3 and feel that case [censored] decided wrongly. - Despite having a law degree myself, I'm personally concerned about Google's legal chances; however, from a practical / world-good standpoint, I think this particular case is of epic proportions and we -- as consumers, historians, humans -- will lose out if this mockery of "intellectual protection" is allowed to persist. P.S. -- Your filter is obnoxiously over-strict. It took me many tries to get this approved. Please, just use a bleeping plain-word captcha or whatnot. Can't even use the past tense of "is" for crying out loud! Just for the record, it took me four tries to get my comment past your filter -- it kept sticking on the past tense of the word "is," just like the earlier comment. Does your weblog server have something against the past tense of the word "is"? Is it copyrighted by someone? Sorry about the spam filter. It's MT-Blacklist and it's gotten out of control. Workin' on it. I have been following Mr. Lessig's attempt for the Commons Copyright program and the problem with "Orphaned" books. I heard him speak in the 60s. I respect this man. However, copying a whole book without permission regardless of intent has been ruled infringment in many cases, and should be here. Google does not own these, but are getting them from libraries as Harvard, Univ. of Michigan and others...which concerns me, as these institutions have been bastions of copyright protections for years. What has changed? At one point the New York Public Library wouldn't even let the author copy his own recording of his composition performed for the Composers' Forum. Google's Print, or whatever the current name is, copying is a purely commercial venture, or they would not be doing this...thereby infringing. Techno-determinism isn't how you change law. Just because technology enables something doesn't make it the law. Mr. Lessig is very much a legal thought leader in the digital age, however, he is wrong on this issue. If the courts disagree, well then, lots of things will become free to copy for "indexing" purposes. The MP3.com case ruled on three points. 1. Is MP3.com a commercial entity? 2. Did MP3.com make one or more digital copies? 3. Did MP3.com get permission to make the copies? Substitute Google for MP3.com in the above and calculate your own results. Many of the infringing works that MP3.com copied were never published to the world - never, not one itty bitty bit - the act of making the copy caused the violation. It's really not about all the glorious things that you can do if you have a copy that you can index, it's really about whether you have permission to make the copy. Get with it Google-guys and gals, "Organize the worlds information about copyrighted works and copyright holders." Now that would be a terrific service!!! Create the marketplace for copyright holders and the sale of rights to their works. Wow, that would be huge. It's just a gigantic card catalog. What is the issue? Google is making the works more accessible. What is wrong with profiting from that? Google is not removing or stealing any value. In the end, there is more value to be shared by all (Google, authors/publishers and consumers). Why is this bad? ?